Thursday, August 15th, 1999 started out pretty much like a normal Thursday with the alarm clock going off at 4:15 A.M. I know, I know. Some of you are thinking, what an unearthly time of the day to get up! I'm an early riser by habit and by choice. I really enjoy the long afternoon and evenings that it provides. I seem to get much more done around home, plus it allows me to get in some really great riding time (the REAL reason). Today was supposed to be seasonal for August in the upper Midwest, with highs in the low 80 s and lots of sunshine. The prospect of such a superb day really drove home the old saying about work being the curse of the riding man. "I'11 be okay once I get to work," I told myself. It didn't happen that way, as my mind kept wandering to thoughts of what was to come later in the day. You see, my shiny green 1977 "Sport Convert" was sitting in the garage at home all gassed up and packed for the weekend. 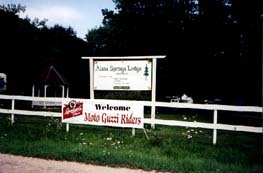 As soon as work was done I would be heading for Richland Center, Wisconsin and Alana Springs Campground, the site of the 15th annual Wisconsin State Moto Guzzi Rally. After what seemed like one of the longest work days on record, 3:00 P.M. FINALLY arrived! My usual 20 minute walk home from work also seemed to take forever. 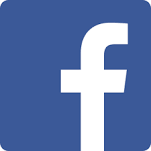 Once I got home I changed into my riding gear, got the bike out of the garage, said my good-byes to my significant other, and hit the road for Richland Center. I was looking forward to the 160-mile ride that would take me to the southwest corner of Wisconsin over some very scenic two-lane roads. I was born and raised in Wisconsin, so I may be a bit prejudiced, but I think that we have some of the best-maintained scenic roads anywhere in the U.S.A. The western half of the state is especially nice because it is bordered by the Mississippi River. Another factor is that during the last Ice Age the glacier that covered the eastern half of the state didn't get as far west or south, so the terrain in that part of the state didn't get ground off and flattened. It turned out to be a perfect afternoon for a ride. 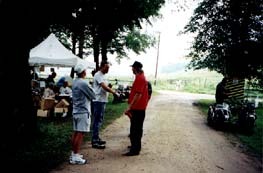 I was having mixed feelings because I was enjoying the ride so much, yet I wanted to get to the rally site to help the other club members with set-up for the weekend. Several of our members had taken Thursday off just for that purpose, so I had no doubt that things were getting done. Even though it would be a very busy weekend, I was looking forward to seeing everyone again. When you're the host, rally weekends are REALLY hectic! You plan for a year ahead, hope that the weather cooperates that weekend, and most of all, you try to make sure that everyone enjoys himself. The roads and the scenery just kept getting better and better, so I knew that I must be getting close to Richland Center. I usually come in from the west on Highway 14, and yes, sure enough, there was one of our two-feet by four-feet rally signs pointing the way to Alana Springs Campground. About one-quarter of a mile down the town road leading to the campground I saw another sign, one of those diamond-shaped orange ones that indicate roadwork. Oh boy! Sure enough, when I got closer I saw the dreaded words "ROAD CLOSED." We have an old saying here in Wisconsin, "We only have two seasons, winter and road construction." Now was really not the time or place for it! This should make it really interesting for anyone coming in from the west to get to the rally site. We'll have to do some creative sign work first thing in the morning, giving directions for the other route to the campground. So I backtracked to Highway 14 and went into Richland Center and took a left onto Highway 80. About two miles north of town was another of our signs directly everyone down County Road A to the rally site. I was expecting several of our members and a few early arrivals, maybe 20 to 25 people, to be at the campground when I arrived. What a pleasant surprise I got. There must have been 50 to 60 people already there! As I suspected, our club members had been busy during the day. Everything from the registration tent, beer wagon, and relief stations were up and ready for Friday morning. I parked the bike after finding a "safe" place to pitch my tent, and unpacked. I say "safe" because strange things have been known to happen during the night at Alana Springs. The soil at the campground seems to be extremely fertile, and plants seem to grow, literally overnight. Take last year, for example. When I got up on Saturday morning my tent was surrounded on three sides by full-grown flowers in bloom! No flowers had been there the night before. Strange! Spooky?! When I finished setting up camp I went to hunt down "Oz" and Laura Oswald, our rally co-chairpersons, to see what I could do to help. They explained that everything was ready for Friday morning when registration would begin at 8:00 A.M., except for the coffee detail. Along with helping out wherever I can, I have become the rally "coffee master." I guess the coffee that I make isn't too bad and, as I stated earlier, I'm an early riser. Generally by the time anyone else in the campground is up, the coffee is hot and waiting for them. With everything under control we adjourned to the campfire for a bit of bike and rally talk. Someone mentioned that it was hard to believe that this was our 15th Wisconsin Rally. That comment started everyone to reminiscing. "Remember our first shot in the dark attempt at a rally?" Maybe 50 people showed up that first time. "How about the year that the temperatures were in the low 100s all weekend?" "Yah, and remember the time that communications got messed up and the rally supplies didn't show up till noon on Saturday!" And can anyone who was at our rally that year forget the TORNADO? Our last exciting experience with the rally was when we lost our old rally site three weeks before the rally! No wonder 15 years go by so fast when you have all that happening. Everyone else was still going strong when I turned in early Thursday night. I needed a good night's sleep for the busy weekend that was about to start. True to form the "mysteries" of Alana Springs once again materialized over night. 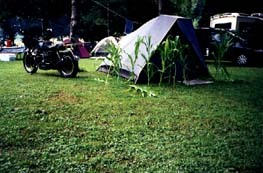 Friday morning when I got up I found my tent surrounded, not by flowers, but by CORN! There was corn that had grown from nothing the night before to three feet in height by morning. Sounds like a case for the X Files! So for the rest of the weekend we had our own somewhat smaller version of Mitchell South Dakota's "corn palace." Friday was another perfect day, sunny and warm. Registration opened at 8:00 A.M. and early arrivals began signing in. About 9:30 A.M. the semi arrived with wood for our Saturday night bon fire. Yes, that's right; I said semi. If you haven't attended one of our Wisconsin rallies you've missed one HUGE bonfire. When the wood is all stacked, the base is about 20 feet in diameter and the stack is approximately 15 feet high. Those members who worked the registration tent on Friday were busy. The flow of riders was intermittent in the morning, but shortly after noon they started to come in at a steady pace. This went on till past 8:00 P.M. that evening. When we finally closed down registration Friday night, we had 185 riders registered. Most of the day Friday was taken up with riders getting signed in, setting up camp, getting reacquainted with old friends, and meeting some new Guzzi riders. Some people also found time to do some exploring on the excellent roads in the area. Our Friday evening meal has evolved into a "serve yourself whenever you want" type of affair. 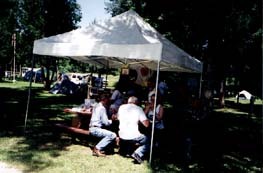 We fire up the grills around 3:00 P.M. and start cooking the excellent old style homemade brats and hot dogs from the local meat market in Richland Center. We keep them hot in Neseo roasters along with an Italian goulash. All the condiments round off the meal deliciously. Whenever you get hungry, just help yourself. With the steady stream of riders coming in, yours truly was still at the grill at 8:00 P.M. that night. Hopefully no one went hungry. We did hit one small snag on Friday. (There ALWAYS has to be one.) About the time we started cooking the brats and hot dogs it was discovered that the brat/hot dog buns somehow hadn't gotten loaded onto the trailer with the rest of the supplies! After several frantic phone calls the buns were located and on their way. Not having buns didn't seem to stop anyone from eating. In fact they got quite creative. Someone came up with the idea of skewering the brats with the handle of a spoon or fork, and the "bratsickle" was born! Leave it to a bunch of Guzzi riders to figure that one out. After a long wait the buns finally arrived and the cry went up, "We got buns!" This seemed to be the catch phrase for the rest of the evening. As with most rallies the remainder of the evening was spent around various campfires and the refreshment wagon, bench racing, telling stories, and catching up on the news with old and new friends. In general everyone was enjoying the camaraderie for which Guzzi rallies are famous. Just to keep the dust settled and to keep everyone around the campground for the "surprise" breakfast provided by the WMGR, we had a light rain on Saturday morning. 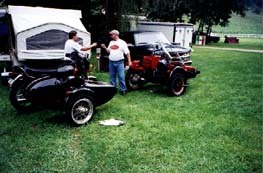 By the time breakfast was over, around 9:30 or 10:00 A.M., the rain stopped and people began to head out for a day of exploring the scenic roads in the area or a ride in the poker run. By 11:00 A.M. the campground was practically deserted! We still had some new arrivals coming in during the day, but with the bulk of the people out riding, this time provided a chance to fall back and regroup. We knew that everyone would be back for the 4:00 P.M. awards ceremony followed by the pig roast. After the awards and door prizes were given out we got down to some serious business, the 50/50 drawing. The lucky winner that took home $221.50 was Matt Pierce! The WMGR would like to take this opportunity to thank all the businesses and individuals that donated door prizes to our rally this year. If I miss anyone it is purely unintentional as we had a lot of prizes donated at the rally. It is hard in all the commotion to always get the names of people written down. To each and every one of you, THANK YOU VERY MUCH! Moto Guzzi North America, Dale's Cycle, Dee-Dee's Cycle, Ace Cycle, Baxter Cycle, MGNOC (Frank Wedge), K&N Engineering, Precision Imprints, Dennis Kirk, Motorcycle Consumer News, Bruce (Oz) Oswald, Laura Oswald, Thomas Carroll, Ron Lischka, Eugene "Sarge" Seifert, Tom and Deb Kelly, and "Maynard". Thanks to everyone again. After a short pause for set up, we were ready to feed everyone. Supper was an old-fashioned pig roast with all the trimmings. We had plenty, and there were seconds for anyone who wanted them. After the meal everyone kind of kicked back and relaxed a bit while rehashing the day's activities. About dark, 8:30 P.M. or so, it was time to light the bonfire. Remember earlier I mentioned this is one fair sized pile of wood? Well, before we can light it we have to contact the fire department in Richland Center and let them know it's lit, so when someone calls and says that a house or barn by the campgrounds is on fire, they know it's only our bonfire. The rest of Saturday evening was spent around the bonfire talking about bikes and the events of the weekend. Everyone seems to turn in a bit earlier on Saturday night. Must be those long rides home on Sunday, or the trip to the Sturgis Rally and races that many of the riders seem to head for from our rally. Sunday morning coffee and rolls were ready early so people could get on the road. Sundays at various rallies are pretty much involved with packing up to go home, saying good-byes to friends, or planning to meet at the next rally on the schedule. The Wisconsin Moto Guzzi Riders would like to thank everyone that attended our 15th annual rally and made it such a success. At final count 225 of you were on hand to help us celebrate. We hope that you had a good time and enjoyed yourselves. After all that's why we do it; so that our friends and fellow Guzzi riders can have a fun weekend. If you enjoyed yourself please come back for our Y2K rally and bring along a friend. 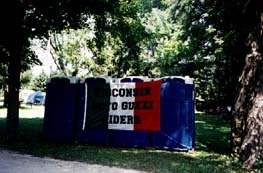 The Wisconsin State Guzzi Rally #16 will be held at Alana Springs Campground, near Richland Center, Wisconsin on August 4th, 5th, and 6th, 2000. Watch for our rally flyer in the MGNOC soon. Hope to see you all again in 2000 !